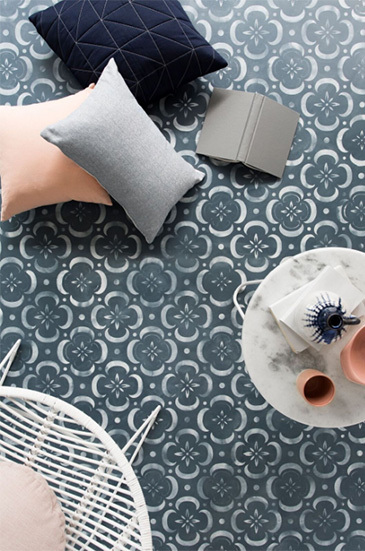 Worried that the ­wallpaper in your front room is looking a bit tatty? Think the bathroom could do with a lick of paint? Well, think twice before you start redecorating. Chemicals from paint can cause serious health problems - both for those who apply them, whether they are professionals or DIY enthusiasts - and those who have to live in the house afterwards. There are also hidden dangers in ­apparently simple procedures such as removing old wallpaper and replastering. Paints used in the home contain ­potentially harmful chemicals such as ­solvents and volatile organic compounds (VOCs). ‘When the paint dries, these chemicals evaporate into the air where the hapless decorator can inhale their toxic fumes,’ explains Dr Deacon. Paint falls into two categories: water-based, often referred to as acrylic emulsions and usually used on walls; and solvent, or oil-based paints which tend to be used for a glossy finish (solvents are added to paint to thin the ­mixture so it will spread evenly). Inhaling paint fumes can exacerbate asthma and ­sinusitis, says Dr Keith Prowse, of the British Lung Foundation. Because the solvents are absorbed into the lungs, then the blood stream, they can lead to headaches and dizziness. ‘If you paint for too long in a room with no ­ventilation, it can even cause a blackout,’ says Dr Prowse. When VOCs are inhaled, they can cause eye, nose and throat ­irritation. In large quantities, ­animal ­studies have linked these chemicals to birth defects, cancers and damage to the central ­nervous system. Professional painters are most at risk: they have a 20 per cent increased risk of a range of ­cancers, particularly lung cancer, according to the World Health Organisation. Meanwhile, in Denmark, ­specialists have identified a ­neurological condition brought on by long-term exposure to paint solvents — ‘painter’s dementia’. And men regularly exposed to the chemicals in paint may be more prone to fertility problems, suggests a study from Sheffield and Manchester University. The World Health Organisation has also raised concerns about the long-term health effects of ‘off ­gassing’, the release of vapours over the life of the paint. Getting paint on the skin can also lead to an allergic, rash-like reaction, says ­consultant ­dermatologist Dr Andrew Wright, of ­Bradford Teaching ­Hospital Trust. So can white spirit, which is used to remove paint from skin. SOLUTION: Water-based paints pose fewer risks than solvent-based ones since they should be toxin-free and also lower in odour. An alternative is to try a ­natural paint such as eco paint, which is solvent, VOC-free and odourless. Natural paints don’t release toxic fumes. And since brushes can be cleaned with water, there’s no need for white spirit or turpentine — another potential source of ­solvents. Always ensure the room you are decorating is well ­ventilated by opening windows. Take frequent breaks in the fresh air and don’t use the room until the paint is completely dry. Lay out dust sheets and consider wearing a ‘respirator’ mask. Solvents are highly flammable — keep paint cans away from open flames. ­Dispose of rags properly — rags soaked with oil-based paints can ignite spontaneously. As a scenic paint instructor, I love taking the fear out of our complicated craft and breaking it down into simple parts. The one thing that scares my students most, it seems, is mixing color. When it comes to the subtlety of mixing off-white, beige tone and even greys, the fear sets in faster and deeper because they know that a mistake often leads to a ton of wasted paint. Below are my favorite tips and tricks that I share with my students to help them build their skill, confidence, and speed at mixing colors – even the subtle tones and hues of an off-white. Pro Tip – Avoid Black: When zeroing in on the final off-white color, it can often be the right hue, just not the right shade. If a color is too bright, often the urge is to add black. In reality, using darker colors like Van Dyke Brown, Raw Umber or Paynes Grey are better choices. They have a magical quality to darken a hue without “graying out” the color the way black can. Ensure you check any existing paint to make sure it is suitable for painting by cutting an "X" in the surface with a sharp knife. Then press some tape firmly over the "X" and pull it off. If any existing paint is removed, this means the surface is not suitable for painting and will need to be removed in the form of scraping and sanding it off. Thoroughly wash away any dirt, dust and mould as the presence of contaminants on the surface can cause loss of adhesion of the new paint system. The easiest way to clean the area is by pressure washing the surface. Hosing the surface with a garden hose will not produce enough pressure to ensure the surface is clean. Sand any remaining chalky surfaces to remove all chalk. Do not paint if rain or dew is expected within 24 hours. Use a high quality acrylic exterior paint, such as Haymes Solashield, as acrylic paints have high UV resistance and last longer than solvent based enamel paints. Paint in the shade, as it will be easier to apply, whereas the sun causes paint to dry too quickly and makes application difficult. Avoid painting in very windy conditions, as wind also dries paint quickly and can deposit dust onto the painted surface. Start on the wall areas and finish with the trims. For more information on painting trims and windows, simply watch our DIY video ‘How to Paint Exterior Trims and Windows’. Now it’s time to stand back and enjoy the rewards. Forget the carpet versus floorboards debate. 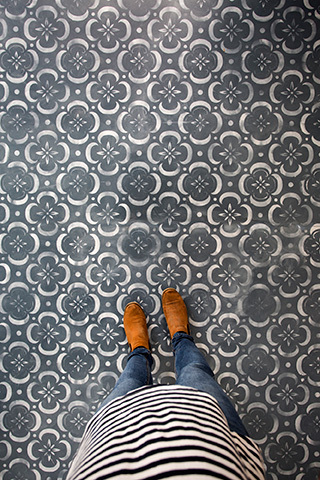 If your flooring is in need of an update but you’re not sure what to do, try this easy and unique stencilled floor design. The design is perfect for an entranceway, to get that wow! factor as you walk through the door. It would also be ideal for a tranquil, getaway space in the house. Please note, this DIY is for an interior timber floor. You will need to adapt the process if you have a concrete or paved floor, or if you would like to use this product on exterior flooring. Speak to your Haymes Paint stockist for more details. Apply your Ultra Premium Prepcoat. As this is a water-based product, it will dry fairly quickly. However, you should allow two hours before applying the main colour. Apply two coats of Gloomy Sky to the surface. Allow two hours for each coat to dry. Once the main colour of your floor has dried, you then need to apply the Haymes Scumble Medium mixed with Haymes Whitewash 1 across the whole surface, to achieve that washed-out effect. Mix together one part Scumble Medium, one part Whitewash 1 and one part water – this will create a very thin ‘wash’. 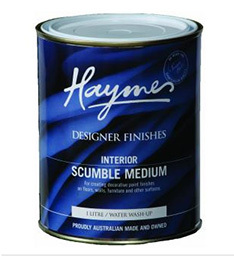 Check out the Haymes Scumble Medium paint can for more detailed instructions. Crisscross the Scumble Medium wash over the Gloomy Sky paint with a paintbrush. Next, roll up a large ball of the muslin fabric, and use this to gently absorb and smudge the wash across the floor to create a cloudy effect. Work over about 1m2 at a time, until the whole surface is covered. Allow two hours to dry. Pour Haymes Whitewash 1 undiluted into the roller tray and roll the foam roller into the paint. Then roll the foam roller out onto some absorbent paper, so that you are left with minimal paint on the foam roller. Lie the stencil over the floor, and gently roll the foam roller across the stencil. The foam roller should be semi dry because you discarded the excess paint earlier. This will create a light, faded appearance on the floor. The paint also won’t bleed under the stencil – this is very important! Allow two hours to dry. Once you have stencilled across the entire surface, apply two coats of Haymes Aqualac Satin to protect against wear and tear. Allow two hours for the first coat to dry. After the final coat, allow four hours for the paint to completely dry before walking on or using the area. And there you have it. 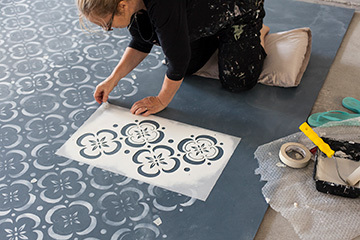 An easy, DIY stencilled floor that will create an instant wow factor right at your feet!